A read-along eBook (enhanced with audio), has a powerful message; it is a heartfelt example of a father honoring the memory of his daughter. Beautiful and creative Noam wrote this story as play to perform for her family on her 5th birthday. Her tale of a flower fairy that possesses very special powers able to help the meanest of people and change them into good and happy human beings is the perfect way to illustrate to children the power of a positive attitude. Written in Noam’s words, it speaks to a young audience and is easy to understand and relate to the story. The children can follow along while voice professionals act out the the story with Noam’s words. Part of the proceeds from the book will go to The Children’s Hospital of Wisconsin. Disclaimer: I received a complimentary copy of The Flower Fairy Super Hero by Noam and Bryan Atinsky for the purpose of an honest review. 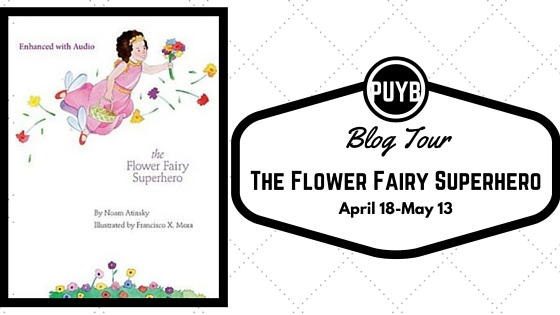 It is my pleasure to read and review The Flower Fairy Super Hero by Noam and Bryan Atinsky. It is an enchanting and original children’s story filled with eye-catching illustrations. The story of the loss of this creative young life fills me with sadness, but knowing that her story lives on and may be enjoyed by many boys and girls is very uplifting. That a portion of the proceeds from the sales of The Flower Fairy Super Hero will go to help a children’s hospital is a wonderful remembrance for young Noam. The Flower Fairy Super Hero by Noam and Bryan Atinsky teaches a lesson that goodness and love can reach out and change the day of an unhappy “ogre”, and make a positive change to the world. I wasn’t having any success with the book’s audio, and I attribute that to reader error, but I was able to sit with my granddaughter and enjoy having her read to me several times over a period of days and she seemed to enjoy it more with each read. I recommend The Flower Fairy Super Hero by Noam and Bryan Atinsky for the young ones in your life and I give it four steaming hot cups of Room With Books coffee. I am currently owner and Chef at a restaurant in Milwaukee. Before the death of my family, I was, for many years, a journalist and Executive Editor at a news organization based in Jerusalem. Being able to do a good percentage of my work from home, I was able to be an at home father, facilitating my wife to be able to work full time at a biological science lab. 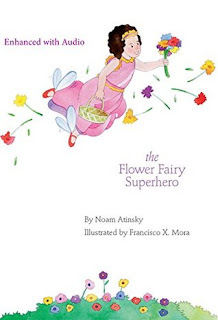 Because of this, I was deeply involved in bringing up Noam and my son, Ya’ari, from an early age.Noam wrote the play, which became the Flower Fairy Superhero book, for her birthday, only 3 months before she was killed while visiting family and friends in Israel. Soon after the accident, a Hebrew version of her play was published in a national newspaper in Israel. This got me thinking that publishing her play as an illustrated children’s book would be the best way to honor her memory and creativity as a living memorial. I had thought of going to Francisco X. Mora, an artist and family friend who knew Noam, and has illustrated many children’s books over the years. Quite unexpectedly, he came to me, after reading a copy of Noam’s play, and requested that he be able to work with me to make Noam’s play into an illustrated children’s book. I jumped at his offer.